The lustrous quality of the silk is both seductive and vibrant and offers a new and extincting medium for creative expression. Explore the diverse and fascinating world of Fine Art Fabric through a study of fabric patterning techniques. Using Jacquard paints the workshop will cover all techniques associated with Silk Painting. This will culminate in the students holding a broad understanding of this rich and complex medium.. Learn how to use and include encaustics techniques in your work. Control and manipulate hot wax to create beautiful interesting finishes that are unique to the encaustic medium. 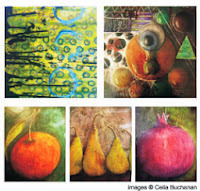 Combined with other painting and drawing techniques encaustic can bring incredible depth and richness to your work.